Do not pick up an opossum as it may bite. Seek assistance from an animal-control specialist. Determining the age of an opossum is a difficult task and can only be generalized by its physical characteristics and behavior. Once the opossum has reached adulthood, it is nearly impossible to determine its age without taking it to a veterinarian. Nonetheless, the younger the opossum, the more accurate the age estimation can be. Often, it is necessary to tell the age of an abandoned opossum to gauge its probability of survival. Ask where the opossum was found, if it was brought to you. If it is a kit still attached to the mother's teat, it is under 2 months old. They are born pink and slowly develop hair. The amount of fur covering its flesh can help estimate a kit's age inside the two-month window if it is still attached to the teat. Opossums that young are not likely to survive without their mother. Check to see if the opossum's eyes have opened. A kit will generally open its eyes when it is 55 to 70 days old. A opossum with open eyes is likely to be at least 70 days old. Note if the opossum is still drinking its mother's milk, if you are observing it in the wild. An opossum will generally be weaned at 3 months and leave its mother at 4 1/2 to 5 months of age. An opossum eating solid food with its mother is likely to be 3 to 5 months old, while a opossum on its own is probably older than 5 months. 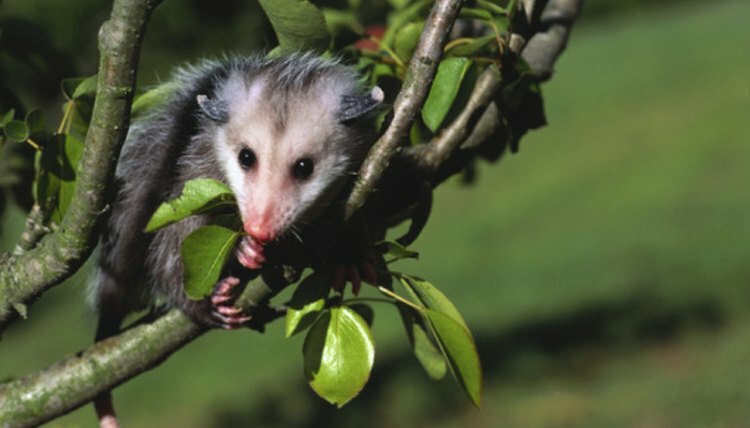 Observe the opossum for signs of breeding behavior or mating practices, if it is in the wild. An opossum reaches sexual maturity between 13 and 15 months. An opossum that is mating, pregnant or caring for kits is at least 1 year old. Consult a veterinarian or opossum specialist to better determine an opossum's age. It is extremely difficult to determine an adult opossum's age without the help of an expert.